From left: Emlie Munson, CT Post reporter, Mark Barnhart, Fairfield Director of Community and Economic Development and Maribel La Luz, Gov. Lamont's Communications Director. 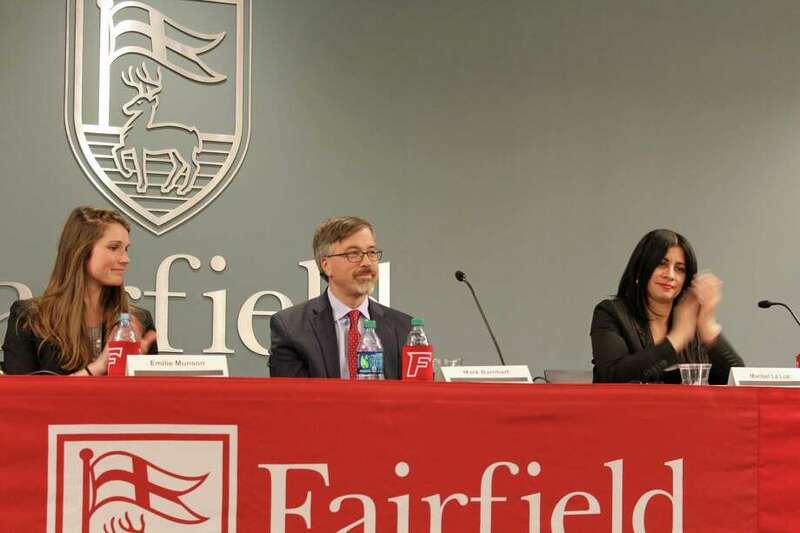 FAIRFIELD — The Fairfield Masters of Public Administration Summit touched on various challenges and proposed solutions for Connecticut in the first months of Gov. Ned Lamont’s administration. And for various attendees, tolls were a forefront topic. A potential tolling plan, unveiled in mid-February, would include 53 toll gantries on Interstates 84, 91, 95 and the Merritt and Wilbur Cross parkways. Lamont’s Communications Director Maribel La Luz said that the administration’s approach was about a desire to listen at all levels. “There’s appetite for a new style and a new willingness to listen and I think so far it’s working,” La Luz said. Recently, Lamont hinted at a compromise with the Republican minority in both houses of the General Assembly, suggesting that short-term borrowing could be a solution for transportation and infrastructure projects before any toll revenues reach state coffers, expected to be by 2023 if passed. Liz Kurantowicz, a GOP strategist and political analyst, was more skeptical about toll revenues, noting that despite a statewide approval of a special transportation fund lockbox, funds would be diverted given the chance. However, all of the topics addressed — marijuana, paid family leave, tolls and even sports betting — are inherently tied to the state budget. On the topic of marijuana legalization, which Lamont remains optimistic would pass this year in Hartford along with paid family leave and a $15 minimum wage, there are still pending questions. La Luz said that the governor supported the expungement of criminal records for previous offenders if marijuana legalization came to pass. Potential revenues from marijuana sales were not presented in Lamont’s budget due to “conservative” planning La Luz said. The panel also included Patrick McCabe, managing partner of Capitol Strategies, and Mark Barnhart, Farfield’s Director of Community and Economic Development. Max Reiss, political reporter for NBC Connecticut, moderated the discussion. Over 50 people showed up in the Dogwood Room of the Barone Campus Center, a combination of undergraduate students, alumni and citizens. Liz and La Luz said that legislation regarding marijuana would involve an educational aspect to address the public awareness aspect. Attendees said they found the panel to be informative and helpful in a manner that wasn’t overtly political or biased. Thomas Iezin, a Fairfield U. student, remarked that the panel was instrumental in bringing concerned citizens together.